It is so hard to teach a child to ride a trike or bike, pushing the pedals. The process is very counterintuitive, having to push with alternating feet. I will contend that this is up there with potty training on some of the most difficult things to teach your children. When Jack was learning to ride a trike I tried different methods to get him to understand the concept of pushing the pedals. I would walk in front of him and push on his toes. I would tell him, push right then left. I would push on his knees. I am not sure what finally worked, but he did learn. My nephew Oliver preferred to not use the pedals on the trike and just walk his feet on the ground. He got so good at it he was really fast. As a result, his shins were always badly bruised from banging into the pedals; we used to cringe just watching him. Now he is riding a small bike with training wheels. It is time to start teaching Will to pedal. He had great success with his balance bike last year, which we hope will help him become comfortable balancing on two wheels eventually. 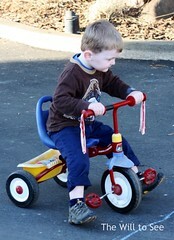 Our thought was to have Will skip the trike phase all together and jump right onto Jack’s old bike with training wheels. We don’t have Jack’s trike anymore (we didn’t like it anyway) and feel like it would be a waste to buy one for a few months of transition. So how did you teach your child how to pedal without breaking your back. Does anyone have a good techniques? Our kids both learned to pedal around age 2.5. It happened at open gym programs where there were different kinds of bikes to pedal. I am not sure exactly how it happened. A lot of exposure to bikes that they liked to ride on. I do remember last summer we spent a lot of time with sore backs trying to teach our Jack how to pedal.